Rental Form T776 called the Statement of Real Estate Rentals must be completed for each rental property that you own in Canada. Form T776 should be attached with your annual personal tax filing. Follow these 10 easy steps to prepare the Statement of Real Estate Rentals. Enter your name and social insurance number at the top of the form. Enter the start date, January 1 and the end date, December 31. If you acquired the property during the current tax year (e.g. 2016) then enter the date of acquisition as the start date. Let’s assume that the purchase date was February 2, 2016. Enter your % of the ownership of the rental property. Let’s assume that you are the sole owner, and therefore own 100%. If there are other owners in addition to you, enter their details below. Enter the address of the property and the number of units. In this example, let’s assume that the rental property is a condo and therefore only 1 unit. Enter the gross rental income earned in the current year. This is the total of rents you charged to your tenants. Assume that the gross rents are $30,000 in this example. Enter the expenses incurred in the current year. 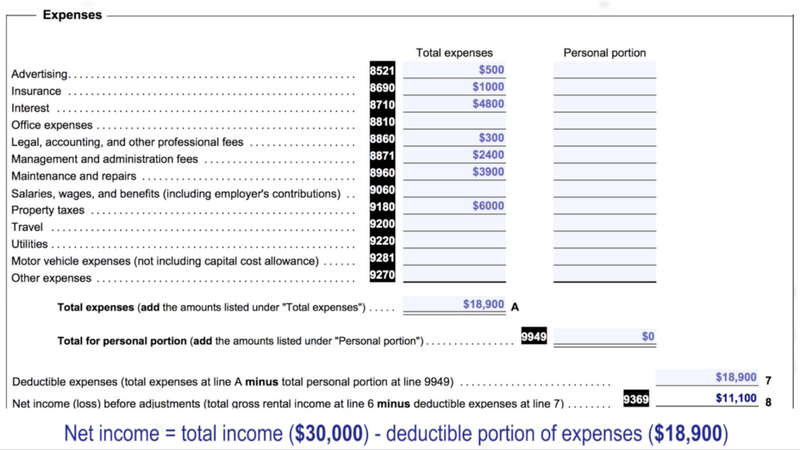 Then enter the total of these expenses which comes to $18,900 in this example. If the entire property is rented out, and none of it is kept for your personal use, then enter $0 for the personal portion. 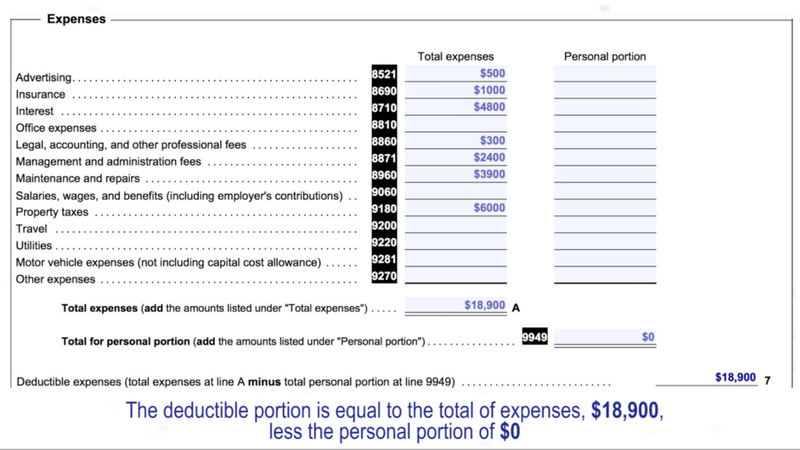 The deductible portion is equal to the total of the expenses, $18,900, less the personal portion of $0. Calculate the net income, which is the difference between the total income on line 6 of $30,000 and the deductible portion of the expenses on line 7 of $18,900. In this example, the net income is $11,100. Calculate the capital cost allowance, which is also known as tax depreciation. CCA is a tax deductible expense. In this example, assume that you purchased the rental condo on February 2, 2016, for $300,000. In column 3, enter $300,000 which is the total of the additions for the year. Enter the same amount in column 5. In column 6, enter $150,000 which is equal to one-half of the purchase price of $300,000. In the year of purchase, you can only claim one-half of the CCA ordinarily allowed in the year. Enter the same amount in column 7. 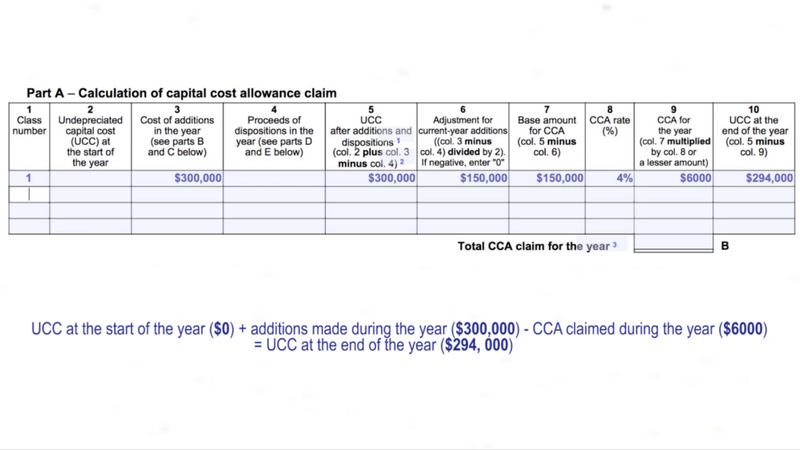 Column 9 is equal to the CCA rate of 4% multiplied by the base amount for CCA in column 7 for $150,000. (4% x $150,000). This comes to $6,000 in our example. Enter the Capital Cost Allowance of $6,000, which we calculated in the previous step, on line 16. You will pay personal income taxes at your marginal rate on the Net Income after CCA. 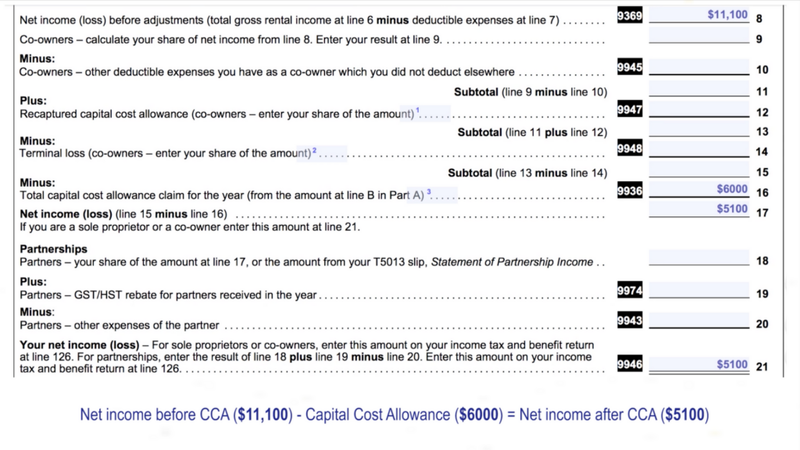 In other words, the net income after CCA is added to your total taxable income. I prefer to deduct CCA on my rental properties, because I get an immediate tax savings. Why forego the deduction and give the government a tax-free loan? You are correct in that you have to recapture the previously claimed CCA into your income in the year of sale. However, according to the ‘time value of money’ concept, claiming CCA is still worth it. This is because a dollar saved today by claiming CCA is worth a lot more than a dollar paid in taxes in the distant future where you sell your property. What you have posted online provides valuable information, and I really appreciate your sharing your expertise with everyone! I have a question regarding a rental Strata unit I purchased in 2016. On Form T 776, I allocated the expenses related to purchase between the cost of the land and the capital cost of the building (Class 1 – 4%). But since the capital cost of the building is pretty substantial (around 227k), should I capitalize the included appliances (about $10000 in value) separately in Class 8 (20%)? 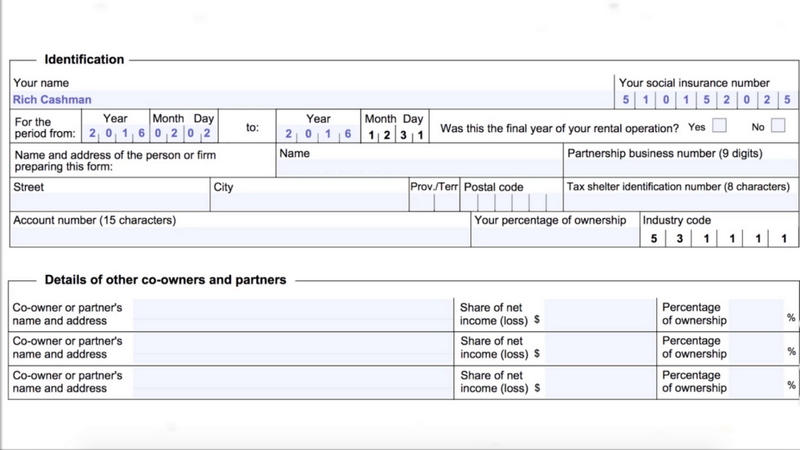 What is the common practice for preparing a Form T 776 for a Strata unit? Thanks a lot for your help! Hi, Wei. Yes, you should record the appliances separately from the building. Appliances should be added to CCA Class 8. Thank you for providing so much useful information on your website. It’s definitely a helpful public service! 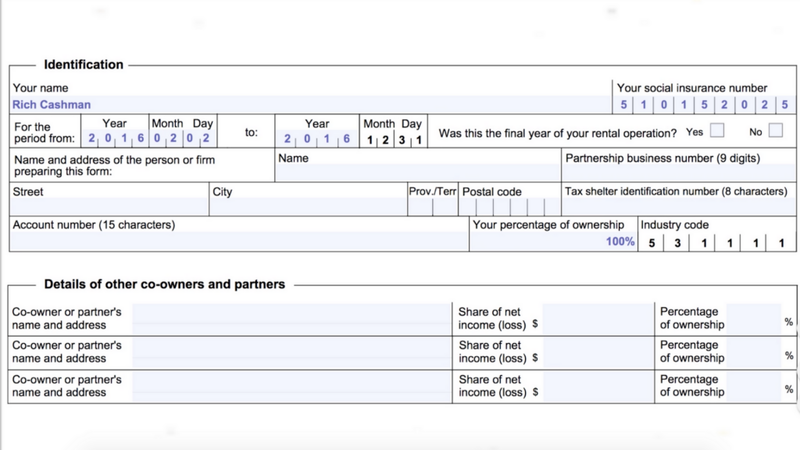 Should the T776 forms show the numbers above or should they be multiplied by the percentage of ownership? Step 1: On Line 1, Part 4 enter the gross amount of the rents collected. 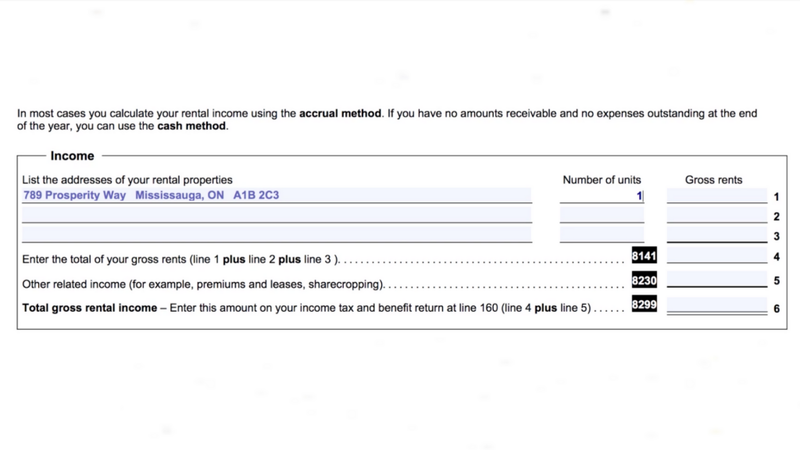 Step 2: On Part 4 enter the gross amount of the expenses pertaining to the rental property. Step 3: On Line 8 enter the rental profit (i.e. gross rents collected less expenses). 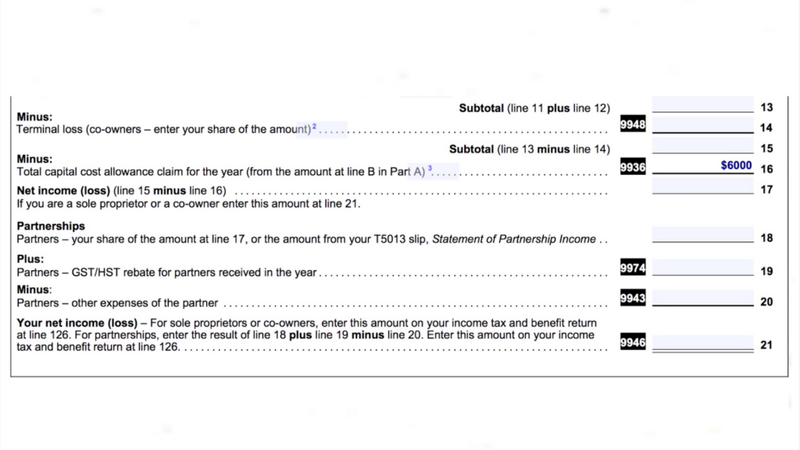 Step 4: On Line 9 enter YOUR SHARE of the rental profit from Step 3 (i.e. 50% of the profit if you are a co-owner). Alan – great website and very helpful ! If my family (Husband wife and 2 kids) are all co-owners (4 of us) are there any rules on how to establish the % of ownership ? It seems very subjective. Thank you for reaching out. You can split the ownership % anyway you want between you and your family members. Keep in mind that minors cannot enter-into-contract and so their ownership of the property should be held through a family trust. Furthermore, for income splitting purposes, the CRA will require that you allocate the income to the family members based on the financial contribution that each family member made toward the purchase of the property. Thanks for the excellent, straight forward guide! I have a rental property, 50/50 co-ownership with my wife, and have a question about CCA. If our adjusted cost base is $400, 000 for a condo we just bought, what would we put in each of our T776 forms in column 3 in step 8? Would I put $200, 000 in mine, and she put $200, 000 in hers? 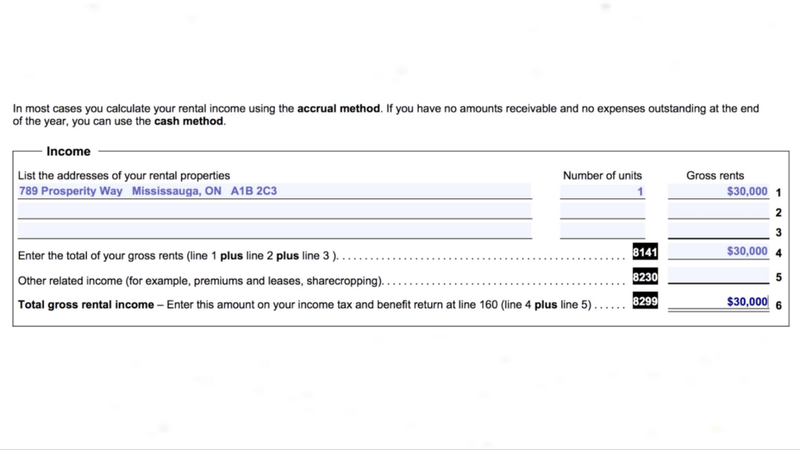 Also, can I claim CCA to reduce my rental income to zero for the year, while she does not? The reason would be that she doesn’t work, so won’t pay tax on her rental income. You would put $200,000 on your form and she would put $200,000 on her form. You can claim CCA to the maximum amount allowed, and she does not have to claim any CCA if she doesn’t want to. This is because depreciation is a discretionary tax deduction. Great video! I am renting a house (making me a 0% property owner) and I am using one of the three rooms for Airbnb as means to reduce our rental expense, similar to having a roommate or subletting. Is it allowed to use a form T776 if we don’t own the property? and if so, can a % of the rent expense be used since % of the property is dedicated for Airbnb? Yes, you should complete form T776 to report the rental income received and expenses incurred. 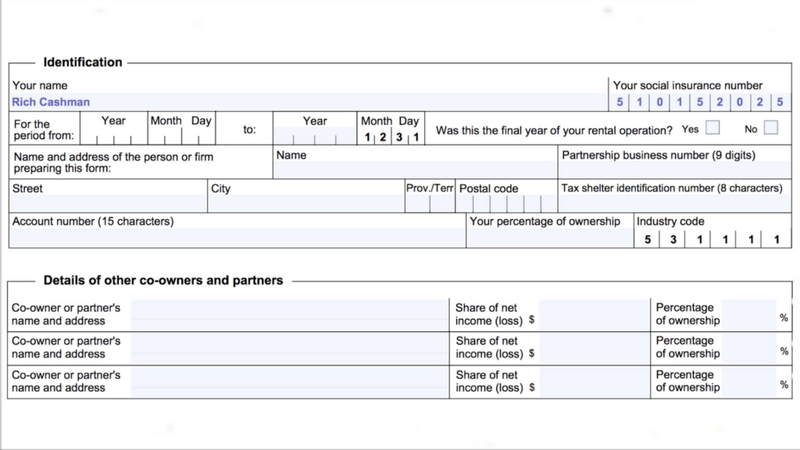 You can deduct a portion (1/3) of the rent paid against the rental income received.